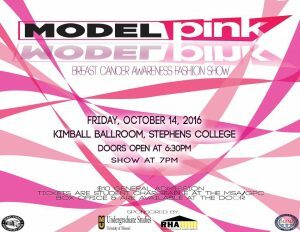 In the continued fight against breast cancer, join us Friday, October 14th in Kimball Ballroom located at Stephens College as we showcase the beauty and magnificence of some of Mizzou’s most poised models. Doors open at 6:30pm and the show begins at 7:30pm. You can get tickets from the student box office for $10 and they are also student chargeable.